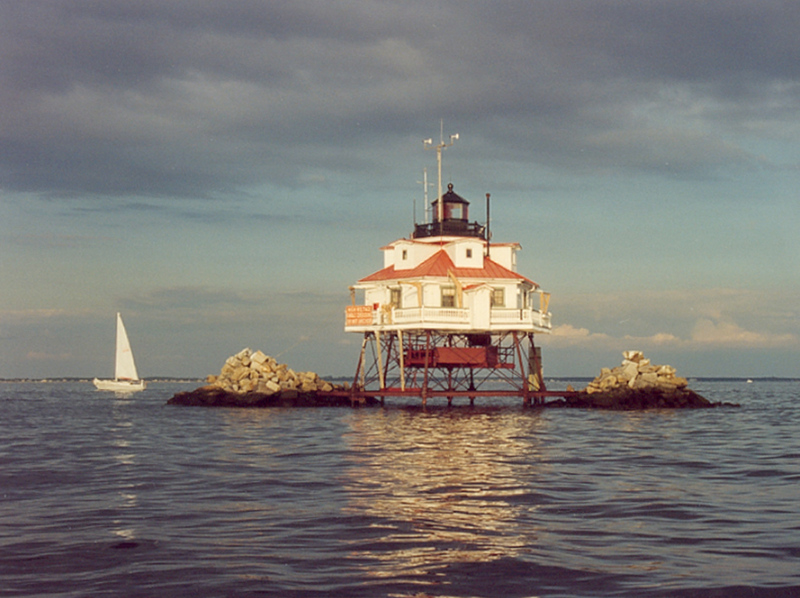 After a four year absence, on August 5-7, 2005, K3L was back aboard historic Thomas Point Shoals Lighthouse (TPL). These dates happened to coincide with the 2005 National Lighthouse Weekend (NWL). 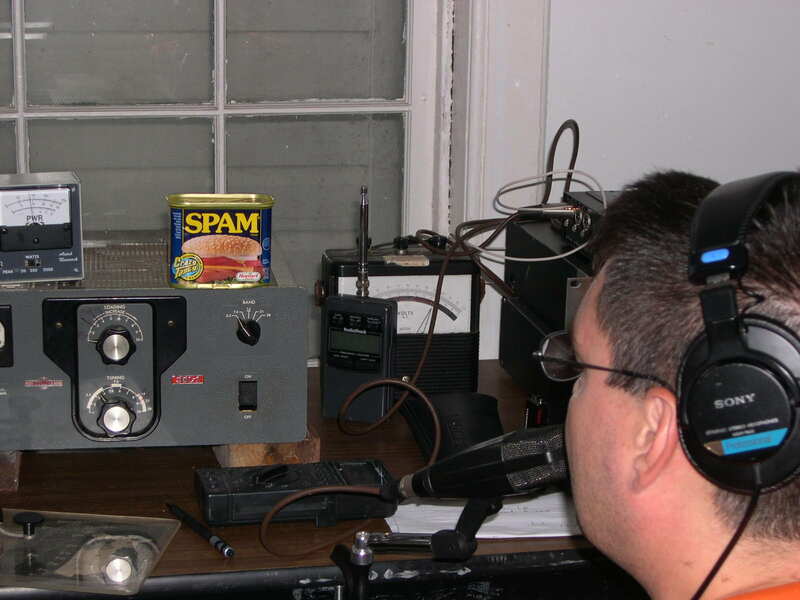 Sponsored by the Amateur Radio Lighthouse Society, NWL promotes operation of amateur stations on or near lighthouses throughout the United States and Canada. This year, K3L operators were Dave W2APE, Paul WA3VJB, Chris KC4CMR and Paul K2ORC. 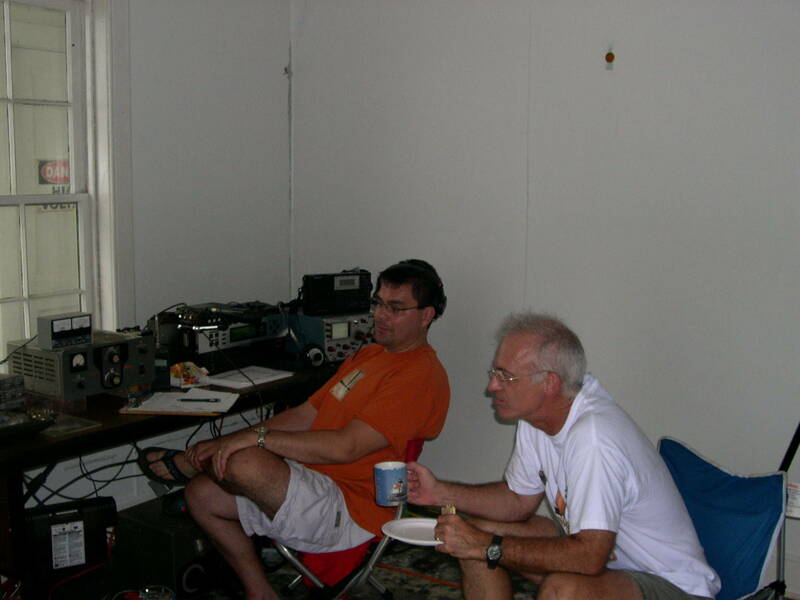 Called a QSO Party, the Lighthouse Weekend includes score keeping with an emphasis on contacts with other lighthouse-based stations. 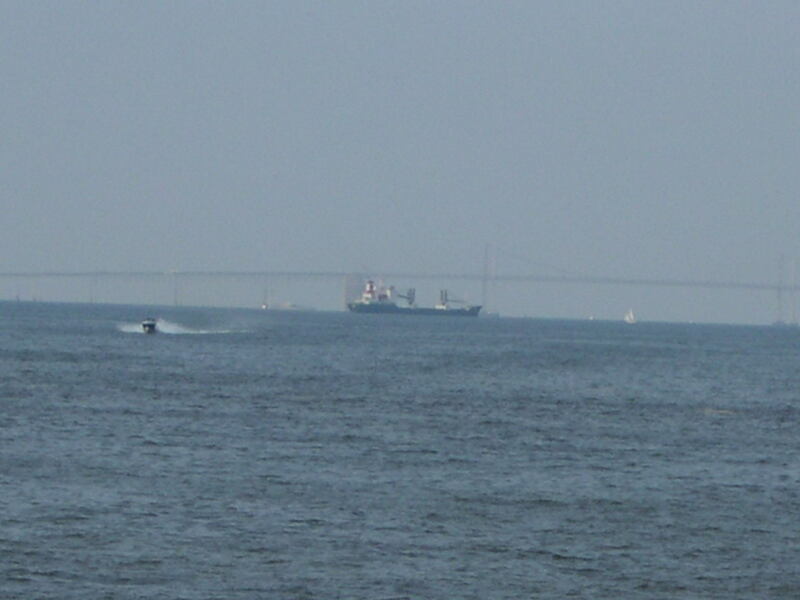 As in the past, the principle goal of K3L was, however, the operation of an AM station at the unique, hexagonal Victorian structure that straddles the Thomas Point Shoals, a mile or so from shore in the Chesapeake Bay. Although AM was the mode of choice for the majority of this year’s contacts, a handful of sideband and CW contacts were logged, too. A Neumann cardioid dynamic microphone, a small Shure broadcast remote mixer, and a 20 band graphic EQ completed the audio chain and WA3VJB brought along his old Novice straight key for CW work. Signal monitoring duties were handled by a Tektronix scope and AC was supplied by a compact Honda 2kw gas generator. 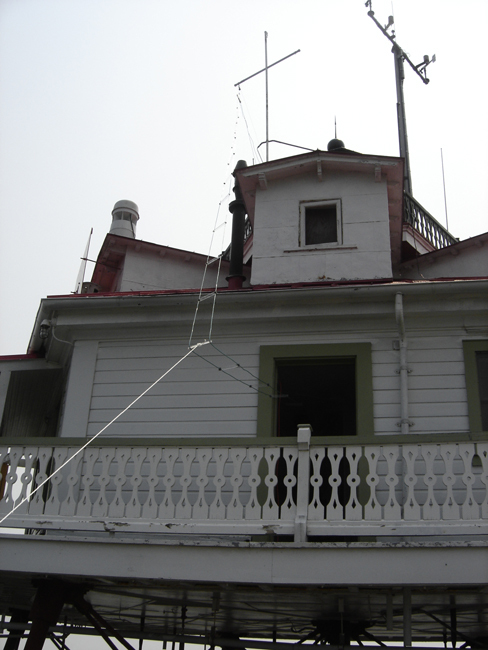 TPL remains a functioning lighthouse under Coast Guard control and supervision. A fully automated, battery powered, 250 watt rotating beacon continues to warn watercraft of all sizes of the shoals upon which the lighthouse stands. Also on the lighthouse is an automated NOAA weather station, powered by batteries augmented by an array of solar panels. Weather and water information gathered at TPL is relayed for broadcast by a NOAA weather radio station in Baltimore. During the morning of Friday, August 5, Paul WA3VJB’s 19' boat was loaded with part of the gear for the weekend, and trailered from his home to a nearby marina. Alongside the dock at the marina, some large jellyfish drifted in the warm shallows, their pale semitransparent bodies trailing long poison laden tentacles that give them their nickname, “stinging nettles”. As Paul piloted his boat to Coast Guard Station Annapolis, the rest of the K3L crew drove to the Station with the rest of the gear. There two members of the lighthouse society’s Chesapeake Chapter graciously helped ferry equipment to TPL aboard the their center console launch. There was a bit of chop on the Bay, a hint perhaps of developing heavy weather. 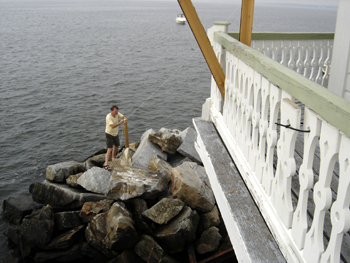 At the lighthouse, the boats were tied alongside the boat dock and equipment was hoisted onto the lower deck. In the early days, the lower deck served not only as a storage area, but was also an enclosure for laying hens and milking goats that supplemented the diet of lighthouse residents. Now, though, it was quickly piled with radio gear, antenna wire, a folding table, folding chairs, coolers, sleeping bags, duffle bags, water containers, tarps, gasoline containers, bags of food and drink and other necessities for the upcoming weekend. Much of the gear was carried up a metal ladder that led to a hatch in the walkway surrounding the first floor of the house which was where the station would be set up. 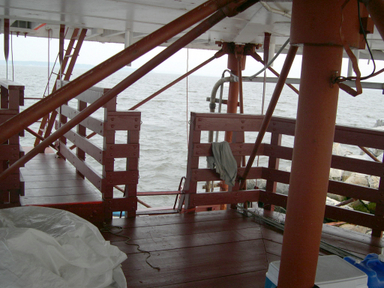 What did not go up the ladder remained on the lower deck, covered by tarps. Since safety restrictions prohibited use of open flame stoves or grills, cooking would be done in a small microwave oven that also made the journey out to the lighthouse. Following an orientation tour by the lighthouse society volunteers, set up began. The generator and gasoline containers stayed down on the lighthouse boat dock and an extension cord from the generator snaked up the side of the house and through a door to the radio room. Since it was early August, the weather was hot and humid and doors and windows, none equipped with screens, were opened to take advantage of the cooling breeze. On land, such openings would have quickly resulted in a plague of flies and mosquitoes, but on TPL few if any insects, flying or otherwise, were in evidence. After setting up the radio equipment on a folding table, the next chore was erection of the antenna, a 60 foot dipole made of jacketed #8 multi-strand. The antenna was center fed with ladderline, also #8, with 6" plexiglass spreaders. 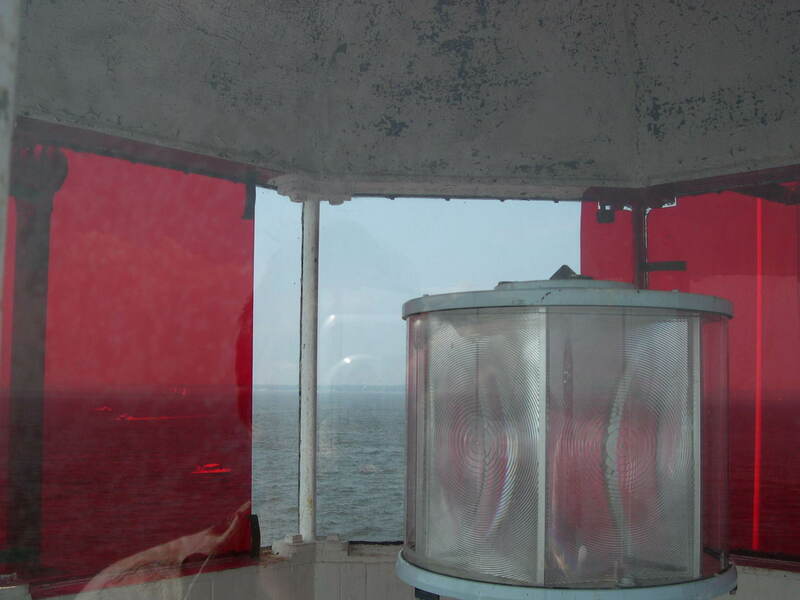 The center point was secured with parachute cord that was to be passed through a pulley hanging from an arm of the halyard mounted outside the beacon enclosure. The halyard, made of heavy pipe, was bolted to the railing skirting the walkway around the beacon. To get to the pulley, the halyard had to be dismounted. The halyard was top heavy and space on the walkway limited. The group effort required to remove and replace the halyard was reminiscent of the famous 1945 photo of Old Glory being wrestled aloft on Mt. Suribachi. Adding to the drama was the fact that anyone unlucky enough to overbalance and topple over the railing would first hit a tin roof below the walkway before plunging 30 feet into the Bay. One of the two large rock piles at the base of the lighthouse was close to what would be the “splash zone”, so it was fortunate that there were no accidents. With the antenna’s center point secured, it was time to go down to the rock piles, one at either end of the lighthouse foundation, and anchor the ends of the antenna, thus making it an inverted V. Lengths of parachute cord were tied to each end of the antenna and the other end of the cord was fastened to a plastic gallon jug filled with water. The jug was tossed from the top walkway down to the rocks where one of the operators waited to anchor the ends of the antenna. It was soon discovered that the large piles of rocks were a popular dining spot for some of the gulls and other waterfowl that make their home on the Bay. While clambering over the boulders and looking for suitable anchor points for the antenna, a hand occasionally ended up in fishy remains or the digestive byproducts of obviously well fed fowl. At close quarters, the bracing tang of salty air was no match for rotting fish and fresh guano. With the station set up, the antenna aloft and tuner adjusted, the first entry in the logbook was made, Ken W2DTC on 3.880. Unfortunately, K3L was not destined to enjoy a typical Friday night of AM fun on 75 meters – or anywhere else. Darkening skies and rapidly approaching thunder and lightning prompted a quick disconnect of the antenna. For the rest of the evening, claps of thunder and wind-driven rain rocked the lighthouse and spectacular cloud to water lightning slashed down at every point of the compass as the feedline flapped in the wind, its ends dangling just above the water. 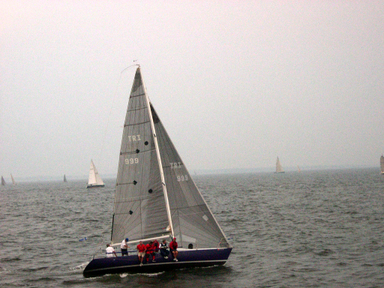 The generator was turned off and in the absence of radio, the evening turned to conversation and watching some 150 sailboats that were participating in the Governor's Cup Race, a 70 mile overnight yacht race from Annapolis to St. Mary’s City that had started before the weather turned ugly. As the storm lashed the Bay, some of the sailboats passed close to the lighthouse, tacking and heeling, their crews drenched and windblown. As darkness fell, the boats’ running lights bobbed up and down in the rainy night before disappearing into the distance. Two sailboats were later reported to have sustained lightning damage. Meanwhile, a mile or so away against the backdrop of the massive Bay Bridge, the lights of freighters and other large ships slowly made their way along the shipping channel while the lighthouse beacon swept the night. Saturday dawned clear. 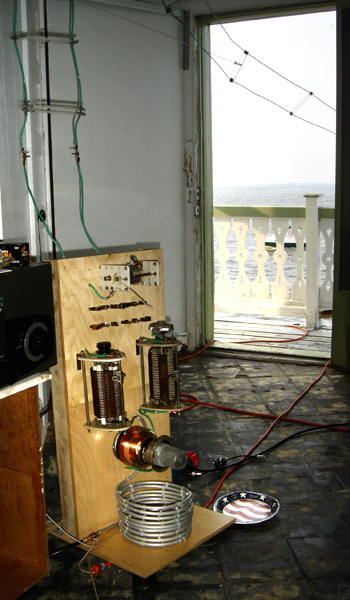 With the generator humming and the sun sparkling off the Bay, K3L was on the air. The first contact of the day was a check in with the Old Military Net on 3.885 shortly before 0600. The log quickly began to fill with 75 meter AM contacts before a mid-morning switch to 40 meters. One of the hallmarks of AM operation is not just exchanging calls and signal reports, but actually having conversations. Some contacts seemed at a loss as to what to talk about after initial exchanges, but after some of them realized that this wasn’t just another contest or special events station, they entered into the spirit of things. Operating a station from an historic landmark on the Chesapeake Bay, there were no shortage of things about which to talk and hopefully the experience introduced to a few people the simple pleasure of casual on air conversation. As darkness fell once more, away from the small electric light in the radio room, light came from an oil lantern. Sitting in the soft glow of the lantern, it was suddenly easy to imagine what the hours after dark must have been like for lighthouse occupants in the days when oil was a primary source of illumination. A keeper lived aboard the lighthouse, sometimes with family, tending the oil-fueled lamp that provided the warning beacon. The old oil lamp’s chimney and vent are still in place. The light from the oil lamp was intensified and focused by a heavy glass fresnel rotated by a counterweight mechanism that the keeper had to reset at regular intervals. Such thoughts were quite a contrast to the chatter coming from the radio room, especially remembering that at the time the screwpile foundations of the lighthouse were sunk into the floor of the Chesapeake Bay, radio was still a few decades away. Radio must have made a considerable difference to those who lived aboard TPL, especially during emergencies. Sunday there was a chance to log a few more contacts on 75 meters before tear down and the trip back to shore. As if to remind everyone that life on the Chesapeake Bay was always subject to the whims of Mother Nature, another storm blew in after the first load of equipment left for shore. Two of the operators were stranded aboard for a couple of hours until the waves subsided enough for a boat to come out and pick up more equipment. A third round trip was necessary to finish the job and by the time everything was back at Paul’s house and sorted out, the shadows were lengthening. Although the K3L weekend was over, it had provided a taste of life aboard a century plus old lighthouse, and the taste only enhanced the fun of operating the station.